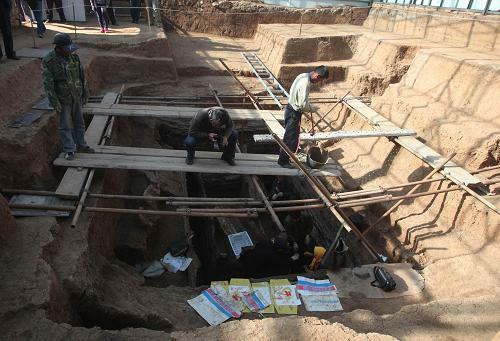 An ancient tomb more than 2,000 years old has been recently excavated in Northeast China's Liaoning Province. This archaeological discovery is expected to break traditional views on ancient civilizations in that part of the country. The tomb, part of cluster that archaeologists began excavating in 1999, lies 5.5 meters underground and covers an area of 72 square meters in Dongdazhangzi village in Huludao city of Liaoning Province. It has been confirmed to date back to the Warring States period. Archaeologists from the Liaoning Institute of Archaeology said that it is the largest tomb from the period ever excavated north of the Great Wall, making it of great academic value. Wang Wei, dir. archaeology inst. from Chinese Academy of Social Science, said, "The tomb is quite large, and high-level funerary items show that its owner was of high rank, which point to the identity of the owner." Besides part of the tomb owner's bones and teeth, many high-quality funerary items, including double-handed ring-pommel knives and agate circles, as well as animal skeletons have been unearthed. There were also a lot of delicate pottery pieces discovered in the tomb, and experts say they show strong characteristics of Central China. Archaeologists said the ancient tomb combines the burial customs of the local minority and the Central Plains of China, as well as the middle and lower reaches of the Yellow River. 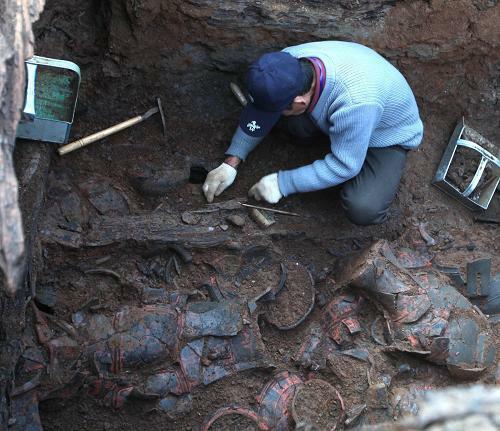 Hua Yubing, deputy director of Liaoning Institute of Archaeology, said, "We found that the uncovered items showed the changing process: the indigenous culture became weak, while the Central China's cultural influence became strong." Archaeologists have finished the major part of the excavation work. As of November 2011, archaeologists working on the cluster as a whole have located 137 ancient tombs, cattle skulls and pottery in the style of the Central Plains of China.